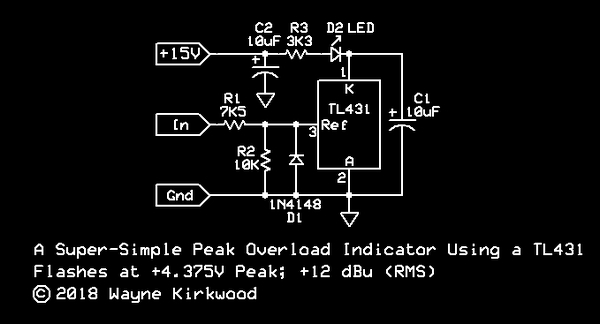 For the polar opposite of "simple" peak flasher, here is the overload indicator I designed back in 1991 for the big dog AMR consoles. Probably some 60 of them inside a single large format console. While this looks like a lot, every part shown cost pennies (if that) and was machine inserted. The bicolor LED was the only hand inserted part. The single most expensive part was the bicolor LED, green for signal present and red for overload (roughly 3dB before clipping). Next the dual op amp was maybe $0.12 to $0.13 (for two op amps so $0.07 ea). The reason for all the complexity was for useful features. The input node labelled "smple" accepts the cathode end of multiple diodes sampling audio from several different points in the channel strip. This way we get both polarities of sine waves and sample signal levels pre/post fader/EQ. The green "signal present" starts lighting around -20dBu with somewhat modulated brightness, but the LED current for both polarities is steered or stolen from the resistor divider string spanning between the two rails so zero net ground current, and PS current draw is incremental or modulated, while the LED itself exhibits some snap action for sharper knee behavior. The signal present is incremental and modulated while the overload indication has positive feedback hysteresis so even narrow spikes will indicate long enough to be seen by users (while I didn't test it at 500 kHz, my console didn't pass 500kHz). As typical for my old designs, lots of moving parts and a bunch going on that may not be immediately obvious. I'm going to have to look at those moving parts again. Glad I don' have to solder yours up on some perfboard. I did this one back in the late 70's. I threw LM339s at the problem. The first LM339 is a negative peak detector using the open-collector output of the LM339. I think I'm ready to take on the challenge of an "all TL431" bi-color two threshold. I might be able to do it with 3X TL431 by borrowing some of JRs moving parts in his bi-color flasher. The low-level threshold might require a third TL431 for bias. Am I limited to a two or three pin LED? Yup, building a console that way would be rough, but I know one guy who did one... I was never that crazy. I've made numerous simple meters with LM339, oddly I never made a meter using LM391x series.... I did prototype a simultaneous peak/ave meter with a 3916(?) by multiplexing between peak (dot) and ave (bar), but never used any in production. sounds like good clean fun. In my kit business I used 3 pin bicolor LEDs. I made a slick level threshold circuit (used inside my CX decoder kit to calibrate playback level) from a PNP LTP with the two collectors driving the two different colors... green for below threshold, red for above, and both colors lit for just right. Make one of those with less parts. At Peavey they had a two pin bicolor LED in the system so I used that. In my current drum tuner the SMD bicolor has 4 pads so each LED can be addressed independently. I probably don't even remember what every single component does in my old console circuit, but my signal present/OL indicator was tweaked for presentation to give an easy to interpret, pleasing display, "and" not corrupt the audio channel grounds, or PS with current spikes. As I recall it took more than one attempt to get it right. I wasted a bunch of time trying to make a useful display from the third color (both), but it never seemed distinct enough or obvious enough to use. The either/or green or red only seemed less subject to misinterpretation. The only thing (main thing) I didn't like about that circuit was the nonlinear loading from the multiple sampling diodes. I only sampled audio from low Z op amp outputs, but ideally every load in a high performance signal path should be linear. I recall one later (smaller) console I did with tons of alternate inputs but only a modest meter bridge. Bi-color signal present/OL circuits on every internal audio path was extremely useful for A) finding signals, and B) keeping them clean. At least one popular mixer sold back then was notorious for not sampling clipping in the input channel pre-fader, while spending millions advertising that they had high headroom (cough). I could easily demonstrate hard clipping with their mixer without triggering any OL indication but the sheeple believed the advertising and figured they were clipping some later path with less headroom. Another obscure trick I did inside a monitor console was a variant on my FLS invention using a compound differential pair with multiple input transistor so only the one loudest, highest voltage device, steals all the current. I bused all the inputs together into this compound differential so you could scan across and see which one channel was the loudest by a line of LEDs across the top of the strips, as that one (loudest) input would typically be the channel with a mic feeding back. PS: Another different OL indicator was used in my final kit tape NR (one with all the side chain tricks http://www.johnhroberts.com/p-522.jpg). I was using a complex op amp ripple filter in the side chain with the inverting op amp held at ground for nominal signal level, but losing negative feedback when the op amp output saturated causing the - input to rise. 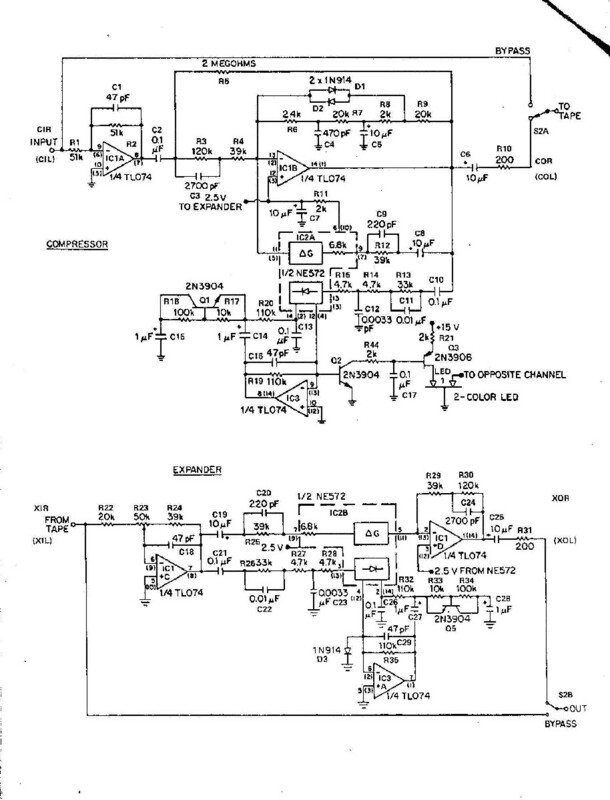 This - input fed the base of transistor to light an OL LED when that op amp saturated. Looks like I used two transistors per to provide some overload hold time and invert polarity to accommodate my common cathode bi-color LED. BTW I get the point about the LED current not returning to signal ground. 2) In a single-supply 9V battery situation returning it to ground is your only real option. 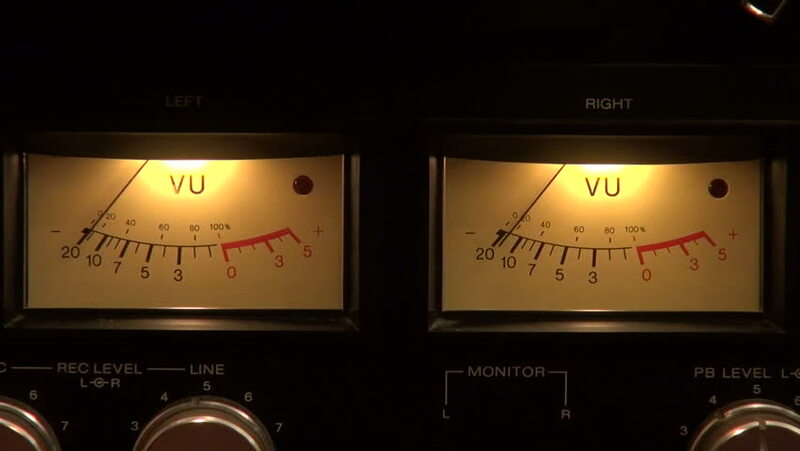 I once did a buffered stereo "VU meter in a box" for John Mayfield before he moved to Nashville. John engineered in those days and worked in a lot of different studios. He never had 100% trust in console meter calibration and wanted to travel with his own meter lunchbox. So I made him one with some Sifams I bought from SSL and added balanced inputs. He also wanted a peak flasher. The little TL431 circuit would have been perfect. LOL! I too am guilty of being unkind on occasions that I was unimpressed. This is a simple positive level detector that you can put outside an existing amp. But for integrated into an amp, there are places in the feedback loop that provide clear indication that the range of the output has been exceeded, and make no assumptions of why, like a shorted output. But then you may want a separate indicator for that kind of overload. Today's reality is that you can buy LED VU meter boards real cheap, so I'm not sure when I'd use this. My suggestion was for simple winky LEDs for use with a mechanical VU or something like an above-threshold indicator on a comp. Where you guys got the idea of using this in a large-frame console or power amp internal overload are your imaginations working not mine. For me, I could have used this in 1980-something VU meter box and saved building a more complex Vectorboard. 1. Seems like TLV431 vs TL431 has a Vref of only 1.25 vs 2.5V. Very confusing eh? 2. Some simulation models "generate" Vref if the Kathode voltage is less than Vref. Strange false behavior! OK, 3. Similar devices (~LT1009) look the same but are not programmable except for a few mill-volts adjustment. Again, very confusing! Thanks for dropping by steveu. I have to wonder if the "LV" low-voltage version of the TL431 came about for 3.3V switching regulator applications. That's one of the primary uses of the '431. The TLV431 shows a 3V3 supply as one of its prominent application figures. I just took a quick look and the data sheet for the TLV431 and it shows the corresponding saturation voltage in comparator mode to be consistent with its 1.25V reference. TI at least got it right. I'm not surprised the sims get it wrong. When we wrote the Phantom Menace it became obvious the simulator treated the Vcc/Vee rails as if they had low output impedance and could source or sink current equally when in fact they usually don't. It showed transient clamping which didn't happen. I never fully embraced sims... Back in the day they were pretty crude, and you kind of had to know everything about the devices to use them, so little point when dealing with obscure components in unconventional configurations. You kind had to know the answers before asking the questions. I did code up a crude software program (in basic) to plot out amplitude response of complex multi-pole audio filters. I found this pretty useful back in the 70s, to put real component values into a hypothetical filter design and see the projected amplitude response printed out using the tab function with my dot-matrix printer. Saved me many hours of melting solder tweaking filters in BBD/CCD analog delay line designs. I was able to tweak multi-stage anti-alias/anti-image filters with overall chebyshev alignment, even one with HF pre-de emphasis incorporated into the filter design seamlessly. Pretty hairy to do with paper and pencil.